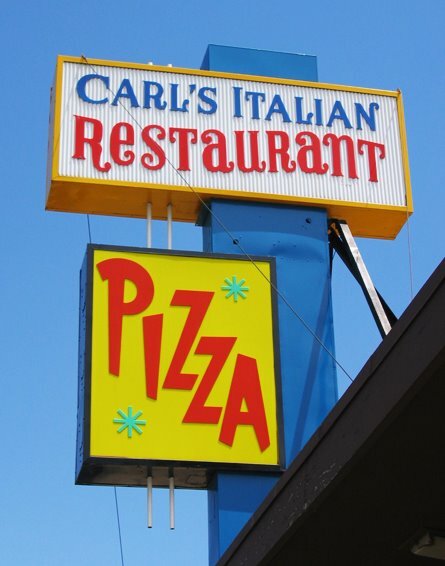 Standout Tidbits: Carl’s has been ladling sauce since 1953 and is the home of a giant Italian sandwich dubbed the “Little Immigrant.” A carb-packed basket of various crackers comes with all the salads. 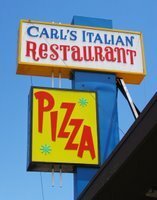 A neighborhood institution in Denver’s North Highlands, Carl’s Pizzeria hides out in a humble brick building that parallels a busy 38th Avenue. Note the plate glass bullet holes and faded red carpet as you enter the establishment, and you’ll know you’re in “old school” territory. Ancient red vinyl booths and vine-and-column murals line the walls as the hostess leads Gavin and me back into Carl’s humble depths and leaves us with lunch menus. We find the service a little slow this busy Saturday, but our young, tatooed waitress is friendly and efficient. We settle in and order a large (14″) pie with green peppers, black olives and mushrooms (the menu also offers other Italian fare, such as pasta, calzones and sandwiches). While waiting for our main course, we munch on crunchy iceberg salads and breathe in the “ambiance.” Our fellow diners range from a fledgling family on a road trip to chain-smoking regulars in the next room. Everyone seems to be noisily enjoying their food, and somehow we, too, must find the kitschy surroundings and lack of pretense comforting, since we seem to find ourselves here at least once a month. Maybe the pound of sugar in my chocolate Pepsi is affecting my sound judgment, but I do feel “at home” in this no-frills setting. Our pizza arrives piping hot and is fairly tasty with a nicely-seasoned but texture-free sauce (not too sweet or salty), and a generous amount of what appear to be fresh toppings and cheese. The mushrooms are happily un-rubber-ish, and the ratio of sauce to cheese is commendable. As for the crust…well…it’s just okay. A little crunchy, perhaps, and not much to it. Frankly, we’ve tried craning our necks to see if they have boxes of Jiffy Crust populating the kitchen area, but no dice. 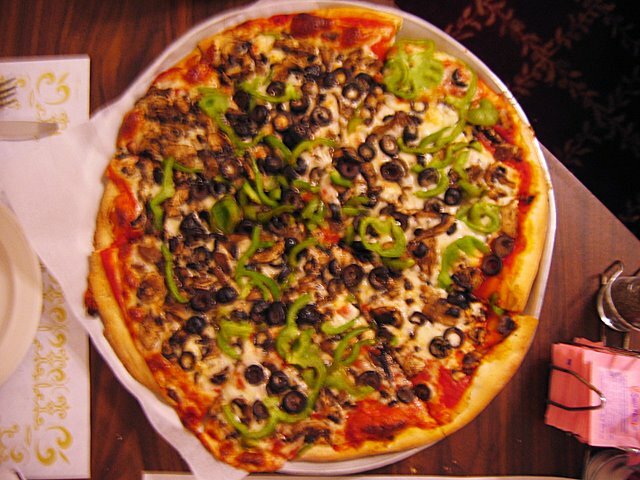 Nevertheless, we manage to put away our slices without complaint – plus, we’ve found it’s best to eat as much as possible on the premises, since Carl’s pizza doesn’t re-heat very well – even in the oven, the cheese turns translucent and the crust becomes a bit soggy. Sigh. This Saturday, however, we can’t seem to eat an entire pizza pie. We leave with full stomachs and about four slices to spare, still knowing we’ll be back once that odd, old school urge resurfaces next month.